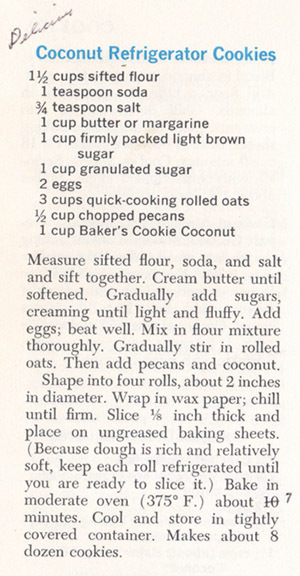 Cookbook #76: Baker’s Chocolate and Coconut Favorites, General Foods Corp., 6th Edition, 1977. 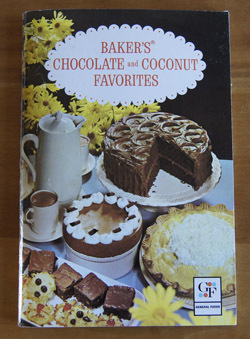 Baker’s Chocolate and Coconut Favorites is a booklet-cookbook given to my mother by my aunt in October 1977. That means it was a birthday present! As per the title, every recipe contains chocolate or coconut or both. This would be the go-to book for a coconut cake or macaroons, or the original recipe for German’s Sweet Chocolate Cake. My mother marked just a couple recipes as tried. Me? I haven’t ever used this cookbook, and not sure if I will keep it or not. Most of the recipes are for desserts, and I already have tons of dessert recipes. These turned out great. 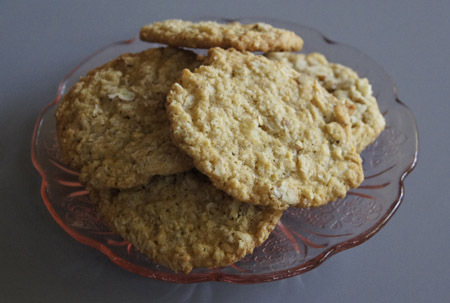 I used butter in these, but next time I’ll use margarine, and that’s how I am writing my version of this recipe (below). Butter often makes cookies flatten out too much, and I’m pretty sure that my mother would have used margarine, since it’s cheaper. Beat the butter in a mixer until creamed, then add the sugars and beat until light and fluffy. Add the eggs and beat well. Combine the flour, baking soda, and salt, then add to the creamed mixture. Stir in the oats on low speed, then add the pecans and coconut. Divide the dough into quarters, then roll each portion into a 2-inch diameter log. Wrap in plastic and chill until firm, a couple hours. Slice into 1/8-inch thick cookies (mine were probably a bit bigger) and place on ungreased or parchment-lined baking sheets. Bake at 375˚ for 8 minutes, or until just lightly brown.